AFTER A century of refining their craft, planemakers have become masters of building safe, reliable jets that bring air travel within reach of the masses. Occasionally their products win cult status among passengers. Concorde, the world’s only reliable supersonic passenger jet, wowed travellers for nearly three decades. But it was a financial disaster that only stayed airborne because of vast government subsidies. Sixteen years after Concorde’s final flight in 2003, another aircraft that passengers love to fly is also facing an uncertain future: the A380. Airbus’s super-jumbo is the biggest passenger plane ever built. It can carry nearly 900 people, though airlines tend to fill it with about 500 seats. Its spacious cabins, smooth take-offs and quiet engines were an instant hit when they took to the skies in 2007. At 580 tonnes when fully loaded, the A380 is a flying hippopotamus; a testament to the supremacy of science over intuition, beauty and–unfortunately–economics. Perhaps the only people who are not enchanted by the A380 are the accountants tasked with finding routes on which it can make money. Airbus conceived the double-decker as a solution to a growing shortage of runway capacity at busy airports. It can be cost-effective, too: when filled to capacity, the aircraft offers lower ticket prices than any other long-haul plane. But the task of filling it every day is tough. Only the world’s very biggest carriers have enough scale to consider buying such an aircraft. And too few of them have taken the plunge. Sales have only numbered in the low hundreds instead of the thousands once expected. As a result the programme is lossmaking and the $25bn or so spent developing the aircraft is unlikely to be recouped. The A380’s only large backer is Emirates, the flag-carrier of Dubai. It is responsible for more than half of the 321 units ever ordered. But the airline is running out of room for expansion at its hub in Dubai International Airport. Moreover, newer and smaller [and more] fuel-efficient planes, such as Boeing’s 787 jetliner, are making non-stop flying between Europe and Asia competitive once more, sapping demand for connecting flights via the Middle East. Emirates has responded by slowing its plans for growth. On January 31st Reuters, a news service, reported that the Gulf carrier wants to scrap its latest order for 36 of the planes. If that happens Airbus says it may set a date for shutting down the beleaguered programme altogether, as it has only a few other customers waiting in the wings. And even those are reducing in number: on February 7th Qantas, Australia’s flag-carrier, cancelled its remaining orders for the super-jumbo. 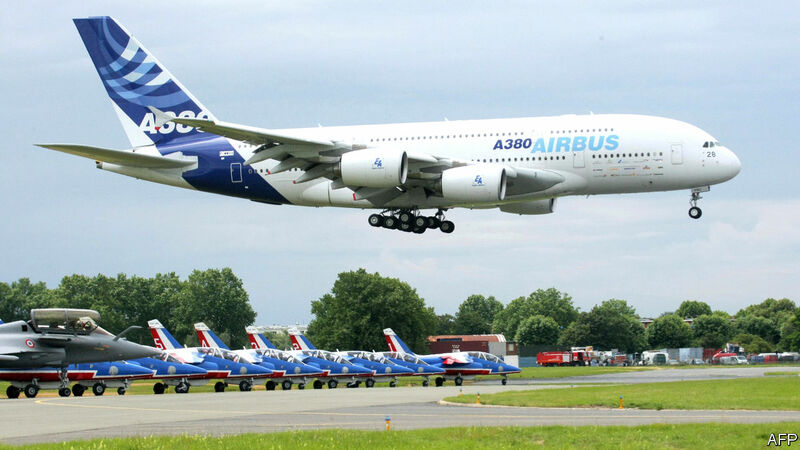 What then for the A380’s future? Once-loyal operators such as Singapore Airlines and Air France are beginning to get rid of the planes. Some of the first ones Airbus built are even being scrapped. Problems with their construction meant that they consumed too much fuel and were too expensive to insure to continue to be used profitably. But many other super-jumbos could have happier retirements. Hi Fly, an airline that operates flights on behalf of other carriers, took delivery of an ex-Singapore Airlines super-jumbo last year. Renting its services is not cheap. But if an airline is confident of filling the plane–in peak season, for example, or for one-off charters–size becomes an advantage. “During the summer most airlines actually would love to increase their capacity, because that’s when they have the traffic,” says Paulo Mirpuri, Hi Fly’s boss. “We can provide capacity to airlines in the time of the year they need it.” Amedeo, another aircraft-leasing firm, is investigating using the same approach for as many as 20 planes. If this business model works, reports of the A380’s death may have been exaggerated. Next PostNext Will the name “North Macedonia” catch on?